Celebrities are a very big influence on an average human. They aspire people with their hard work and fame and come on, everyone gets attracted to fame! And a vast majority of celebrities are actually the common people, kids of local citizen with no big networks or anything. To name a few, Robin Williams, Johnny Deep, Amitabh Bachan, Fawad Khan, Priyanka Chopra, Saba Qamar and many more! All these people started from scratch and as Shahrukh Khan narrated that he was raised by his mother and he was the only son in the family to feed. Dedication is the core of every success, we are taught this all our lives. And when people look at the glamorous life of the celebrities they think that they do not do much effort or hard work for that matter. But when we talk about a normal person with a corporate job, who have to manage family and job along with his/her social life, celebs sail in the same boat too. Fahad Mirza is a certified surgeon and Mawra Hocane recently cleared her LLB with distinction. There are many more celebs who push their limits and challenge themselves to strive more. So, Armeena Rana Khan decided to speak on behalf of all the people in acting fraternity! Actors receive a lot of hate! The Internet is full of it, just open any picture of any celebrity on Instagram and BOOM! You’ll see so much hate that’s being thrown at them. Then this makes people wonder that how come all these celebs have so much of following. Well, the love to hate ratio is 80 to 20, 80% hate and 20% love. There could be a lot of people appreciating their efforts but on the internet, it seems like only haters have taken the toll. 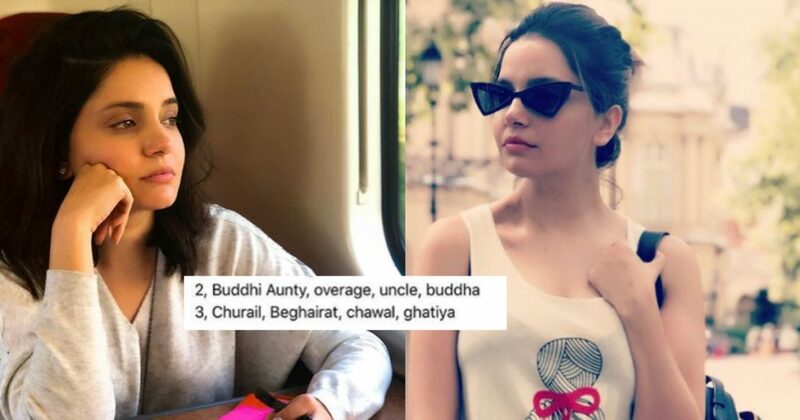 Armeena Rana Khan compiled the most repeatedly hateful comments and you’ll be shocked to read them! You wouldn’t believe that when she posted this list of comments, people under this post got hysterical and started throwing more hate on her, are you guys even for real?! This person is talking about the comments “If exposure of body is modernism than animals are more modern than humans,” Seriously? WTF?! Look look, a hater spotted! Well, kudos to Armeena for speaking this out, not many people acknowledge the hate that’s thrown at them. They are human too and they too get affected by the hate. Armeena recently got engaged to the love of her life and has taken a sweet break from acting. But rumors had it that she’ll soon make a come back. Let’s hope to see her soon on screen. As she’s very specific with about her projects and films. Do you guys have anything to add to the story? Let us know in the comments below.